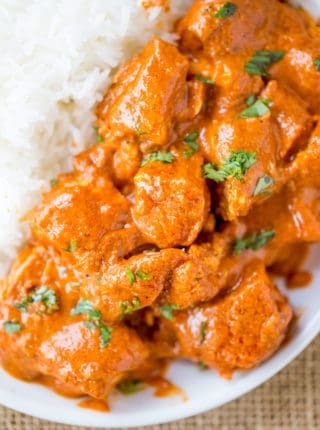 Chicken Tikka Masala is a delicious creamy tomato sauce based Indian recipe made with white meat chicken and plenty of bold spices including garlic, ginger, cumin and coriander. 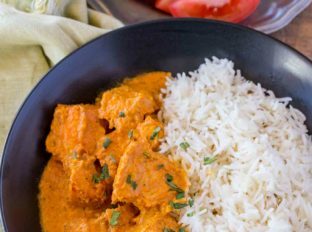 Chicken Tikka Masala is the spicier, bolder almost twin brother recipe to the Indian fan favorite Butter Chicken. Indian Food hasn’t had it’s due on this blog to date which is a shame because it is one of our FAVORITE variety of foods we love to cook together in the kitchen. This Chicken Tikka Masala is the beginning of a new series of Indian recipes I’ll be posting on the blog and is the product of a few weekends spent learning from a family friend’s Indian grandmother about all the flavors, feelings, tips and tricks that go into delicious Indian recipes. The day we made this Chicken Tikka we also made a DOZEN other dishes (I kind of wish I could just share all of them with you right now! ), so as we go we’ll be sharing them while still bringing in a good mix of other non-Indian dishes to the blog. That being said, if you have a request? Please let me know in the comments I would love to post that next if it is a recipe we have made already. AND we are going to be getting together again to cook a lot of appetizers and sides next time too, so I really do hope you all love Indian food! Don’t worry, we’ll be going at a once every 2-3 week pace on these recipes so it doesn’t take over the natural mix of recipes you all love. 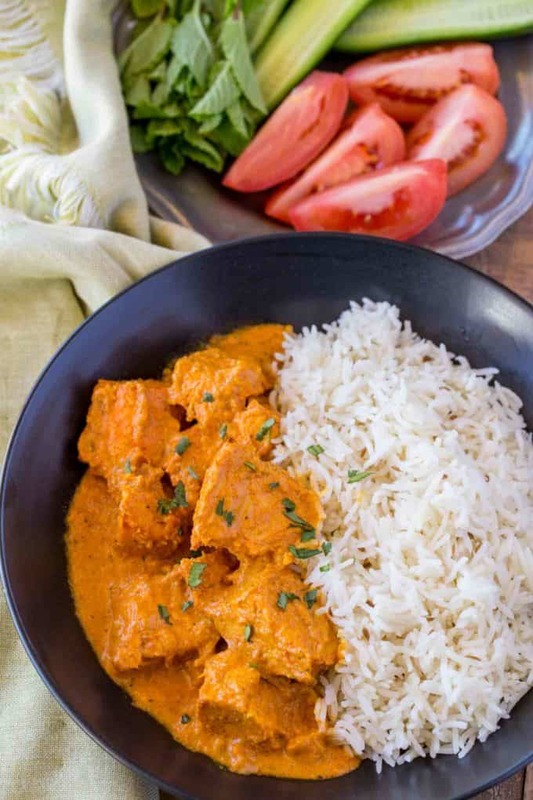 Chicken Tikka Masala is made in two parts with a spiced yogurt and lemon marinade on the chicken and a creamy tomato spiced sauce that are combined after cooking much like Butter chicken. 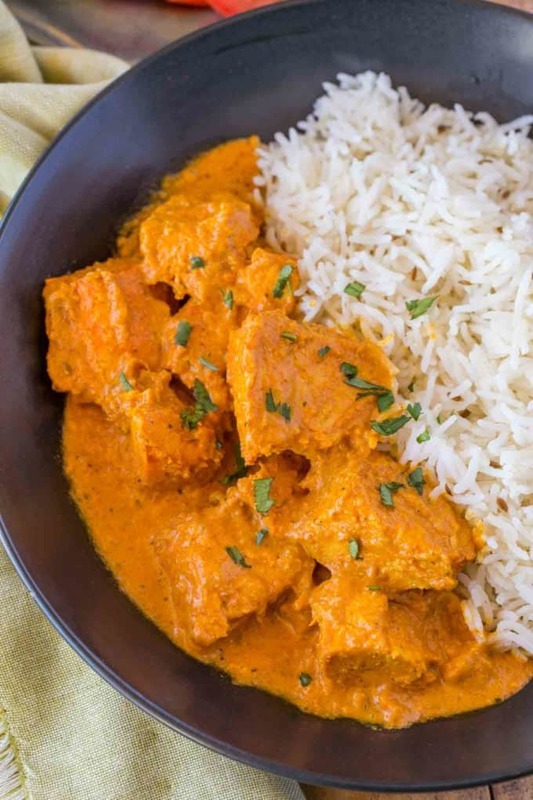 What is the difference between Chicken Tikka Masala and Butter Chicken? Chicken Tikka Masala is traditionally made with white meat chicken while Butter Chicken (Chicken Makhani) is traditionally made with bone in dark meat and contains a significant amount of oil to create a creamy mouth texture. Both contain creamy tomato sauces and similar spices. In many restaurants they are regarded as the same dish, but in authentic restaurants there is a distinction. 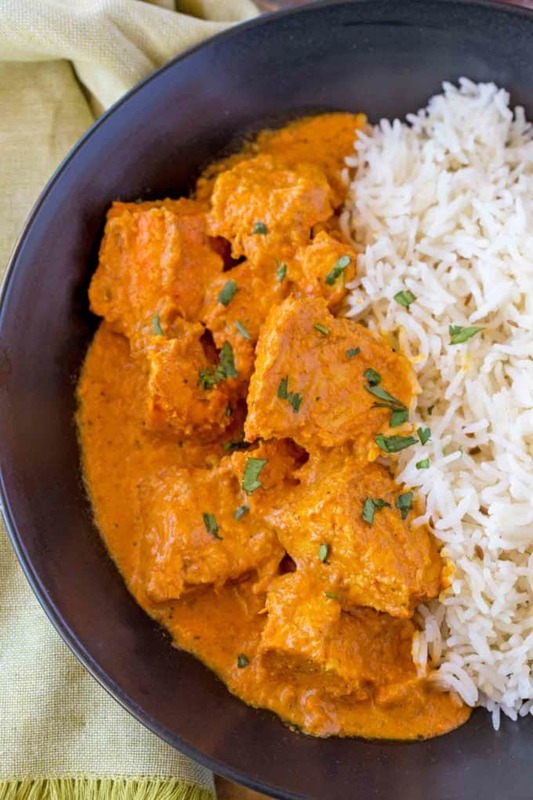 Often times Chicken Tikka Masala will also contain less cream than butter chicken. Cast Iron Dutch Oven: I used to fry in my cast iron skillet, but this dutch oven is perfect for frying larger pieces of food and it keeps heat really well. Plus the lid is a second pan so it is all you need to make this recipe. Cut the chicken into 2 inch chunks. Mix the cumin, paprika, coriander, turmeric, cayenne pepper and salt into a small bowl. Toss the chicken with half the spices, the greek yogurt and the lemon juice and let it sit while you make the sauce. In a large saucepan on medium high heat, add the butter and the rest of the spices, stirring well for 30 seconds until you can smell them well. Add in the garlic and ginger and stir an additional 30 seconds. Add in the crushed tomatoes and heavy cream, stir and let simmer on a low-medium heat for 7-10 minutes. Heat the canola oil in a large skillet on medium high heat. Remove most of the marinade from the pieces of the chicken before cooking. Cook the chicken in batches until just cooked through. Add the sauce to the chicken and mix well before serving. I’m so glad you’re loving the recipes. This is a keeper! I made this tonight and it was delish. The sauce is yummy enough that I could make a meal of sauce & naan and the yogurt marinade helped the chicken cook to perfection. The only thing I did differently was to grill the chicken in the oven for @ 10 minutes. So good! TY! 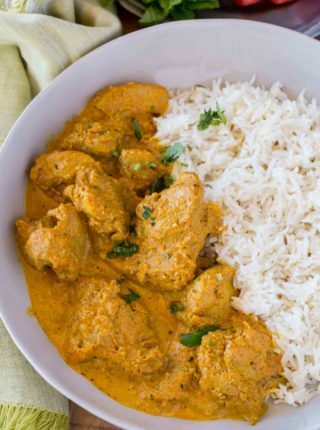 Your slow cooker butter chicken is the best I’ve ever had. Can you adapt this to the slow cooker as well? Do you have any other favorite Indian, Thai or Asian slow cooker recipes you could share? About to make this, In looking at other recipes, the Tablespoons for paprika, cumin & coriander seem very high, is this correct as in Tablespoon vs Teaspoon? They’re correct. Half of the spices are used for a marinade so they won’t all make it into the dish. You can always adjust to more of your liking. I hope you enjoy it! what veggies are served with this dish? It looks wonderful and I can’t wait to try it! A minted cucumber salad would be perfect served alongside Naan bread. Enjoy! No fenugreek leaves? Hmm. That’s the best part of a masala sauce imho. This may be a silly question, but is there a reason you to use crushed tomatoes instead of tomato sauce? Can you substitute tomato sauce? Using crushed tomatoes still gives it a bit of texture vs all sauce. I hope you enjoy it! This is going to be our Supper Club dinner entrée. what would you serve with this dish? I would recommend some type of flat breads such as basic chapati, roti, naan, kulcha etc. buttered or otherwise. Enjoy! Hi! I don’t have any heavy cream – I can make a trip to the store – but I do have a lot of plain Greek yogurt. I don’t use heavy cream much so it might not be something I’d be able to use before expiration. Do you think I could use some of the yogurt in place of the cream? I am excited to try this and I’ve the spices already. I was just wondering about your input on this small issue I’ve run into with my current kitchen supply. I haven’t tested it but I would think that would work. You might want to mix in 1/2 tablespoon of flour with the yogurt before adding it. I’d love to know how it turns out if you decide to try. This looks like a perfect dinner to make on this rainy day! I’m thinking of deviating from the recipe a bit… Perhaps some chickpeas and baby spinach at the end to add some vitamins and bulk (currently on a meal plan) Thanks for the inspiration! Hi! I just found your blog. We love Indian food and wanted to make some yummy masala at home! I would love to see an ez crockpot version as well! 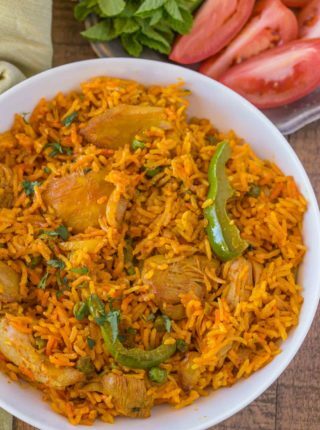 What type rice do you use to serve with? How do I make it like the Indian restaurants?!? Thank you! Excellent and easy recipe. I have made this several times now. The recipe is very forgiving: you can use nonfat yogurt if you prefer, you can use half-and-half or even milk if you are out of cream, both white and dark meat are delicious, I have quadrupled the recipe without untoward incident, etc. I do use much more of each spice than called for (about double) and then increase the liquid because I like a lot of sauce. Thanks for this recipe! You’re welcome, Eric! I’m so glad you enjoyed it! I see your Indian Butter Chicken recipe for the slow cooker. I have it in my slow cooker right now and tasted it for tonights’ dinner!! A-mazing!!!!!!! Thank you! 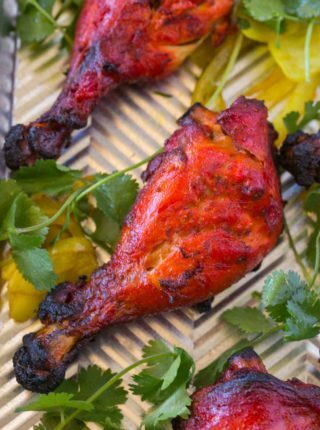 Do you have a slow cooker version of the Chicken Tikka? If not, how would you adapt this to go in the slow cooker??! This recipe is AMAZING! Tastes as good as it looks. The sauce is so good you could even make this with some veggies instead of meat & not loose any flavor. 5 stars for this recipe! love this! I’ve been craving tikka masala lately. Your photos just made me seriously hungry so I need to make this recipe asap! You won’t regret that decision! Enjoy!! 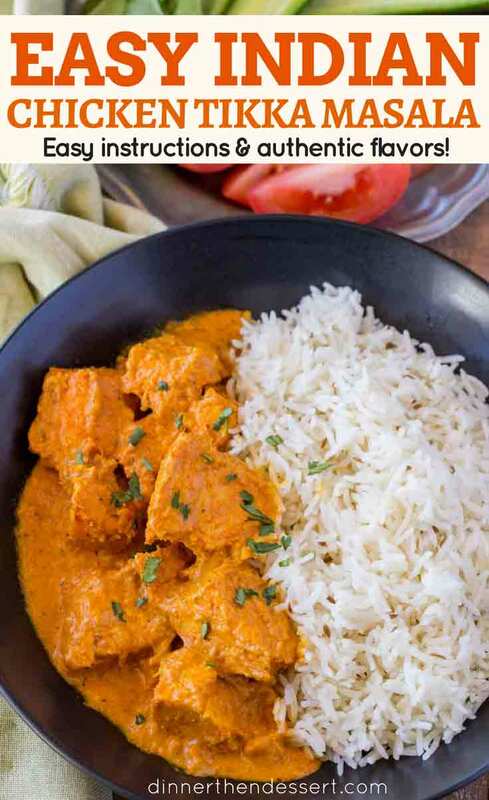 I love all those fantastic Indian flavors! I need to try your recipe! Can’t believe I haven’t made this yet. It looks and sounds delicious! I love that sauce! I can’t wait to try this one. This sounds like the perfect dinner any night of the week. We are huge Indian food lovers. My husband was excited to learn of this post. We are exited to see what is coming. Indian food is our favorite in my home. Thank you for this. I’ll let you know how it came out after I make it. Do you have a recipe for Kheer? Any more Indian recipes would be appreciated. I hope you enjoy it! I don’t have a recipe for Kheer but added it to my list. Thanks for the suggestion. When it says to: “Add in the crushed tomatoes and heavy cream, stir and let simmer on a low-medium heat.”, how long do I let it simmer for?? You want to simmer for 7-10 minutes. I updated the recipe card. Thanks! Could you list complete nutrition for recipes ?Sodium count is very important for most people.I do love your recipes.